Haas F1 Team’s Romain Grosjean rallied to qualify Saturday after a massive crash _ caused by a loose drain cover _ during Friday’s second free practice for what is being billed as the final Formula One Malaysian Grand Prix. Grosjean’s accident capped a difficult Friday for the American-owned team on the 3.444-mile/5.543-kilometer/15-turn Sepang International Circuit in Kuala Lumpur. The disappointment continued during Saturday’s qualifying session as both Grosjean and teammate Kevin Magnussen failed to advance out of Q1. Grosjean, complaining about brake issues throughout the session, will start 16th on the 20-car grid after a lap in 1-minute, 33.308-seconds in his No. 8 Haas VF-17. Magnussen will start 17th after lapping at 1:33.434-seconds in the No. 20 car. Both Grosjean and Magnussen ran exclusively on the Pirelli P Zero Red supersoft tire throughout the 18-minute qualifying session, which saw 15 drivers advance to Q2. NBC Sports Network’s live race-day coverage will start at 2 a.m. (EDT) Sunday. Drivers had one more practice session on Saturday (FP3) before three rounds of time trials, which saw three-time World Driving Champion/point-leader Lewis Hamilton of Mercedes AMG claim his milestone 70th career pole with a record lap in 1-minute, 30.076-seconds. It was Hamilton’s ninth pole of the season _six more than any other driver _ and his fifth at Sepang, which now includes a run of four straight. Hamilton tied seven-time World Driving Champion Michael Schumacher of Germany for the most poles at Sepang. Scuderia Ferrari’s Kimi Raikkonen, the 2007 world champion from Finland, posted a lap of 1:30.121-seconds (0.045-seconds behind Hamilton) and will start second. Red Bull Racing’s Max Verstappen _ celebrating his 20th birthday _rounded-out the top three. Meanwhile, qualifying was a disaster for Ferrari’s Sebastian Vettel, the four-time world champion who will start 20th and last after his car failed to record a hot lap in Q1. Vettel, who trails Hamilton by 28 points in the standings, saw his championship hopes suffer a major blow due to an engine gremlin. A suspected electrical problem during final practice cut his running time short and forced a late engine change. Although Ferrari was able to fit Vettel’s fourth and final power unit of the season ahead of qualifying, a fresh issue surfaced during his first attempt at a lap in Q1. Vettel’s engine appeared to stutter and he reported over the team radio that he suspected he had lost his turbocharger. Vettel slowly returned to the pits where mechanics began working on the car. But with track time slipping away, Vettel exited the cockpit in disgust. Vettel enjoyed a 14-point lead over Hamilton, of Great Britain, just four races ago. A combination of political and financial considerations have prompted event organizers to withdraw the Sepang facility, which first played host to the FIA World Championship in 1999, from the 2018 schedule. The decision, announced in April, ends the Southeast Asian country’s hosting agreement one year early. Prime Minister Najib Razak of Malaysia cited declining ticket sales, viewership and tourism behind the decision to pull out of hosting the race. In addition, state oil and gas firm Petronas _title sponsor of the race _ has been hit hard by tumbling oil prices. Grosjean’s Friday crash occurred with 20 minutes left in FP2, the result of a loose drain cover on the apex of the right-hand Turn 13 and contact with the No. 8 Haas VF-17. The metal cover shredded the car’s right rear Pirelli tire and sent Grosjean spinning off the track and into the barrier on the outside of the corner. Grosjean walked away unscathed, but the car sustained significant damage. Haas F1 was only allowed to work on Grosjean’s car and not that of Magnussen during the curfew, and both cars were observed by parc ferme cameras at all times. All teams are allowed two exceptions to the curfew per season, but Haas’ special dispensation in Malaysia reportedly will not count as one of those. Grosjean’s accident brought out the red flag, while FIA officials inspected the area with track workers. With no immediate fix for the exposed drain set the session was not restarted. “We’re working and we’re trying to analyze everything we can,” Grosjean said Saturday. “We’re really doing our best, but these last few races we just haven’t had much performance. We know the supersoft is not our best compound, in general. We’re struggling to find the right window on tires. We need to just keep working on that. We’re all in the same boat and working hard. It will pay off at one point. Before Grosjean, Magnussen and the rest of their Formula One counterparts participated in knockout qualifying, they had one final practice (FP3) to dial-in their cars. Both Haas F1 drivers sampled the full range of Pirelli’s tire lineup, with each beginning FP3 on the White medium for two installation laps before bolting on Yellow softs and then transitioning to Red supersofts for some flying laps. While an electrical issue in the middle of the session limited his run program, Magnussen set the 13th-fastest time with a 1:33.787-second lap on his 10th and final circuit. Grosjean tallied 19 laps, posting a 1:34.914 on his seventh tour that placed him 18th overall. Magnussen earned his quick time on Red supersofts while Grosjean secured his fastest lap on Yellow softs. Quickest in FP3 was Räikkönen, whose fast lap of 1:31.880 was 0.162-seconds better than Vettel. The first of two 90-minute practice sessions Friday took place in wet conditions. This drastically impacted the team’s running time, with Frenchman Grosjean recording only eight laps and Antonio Giovinazzi turning just six laps as the start of the opening session was delayed by 30 minutes. Giovinazzi, the third driver for Scuderia Ferrari, took the wheel of the Haas VF-17 in FP1 for the fourth time this season. The 23-year-old from Martina Franca, Italy, drove in place of Magnussen, who relinquished his seat in the No. 20 car for Giovinazzi to gain additional Formula One experience. Gaining that experience was muted by the rain, with Giovinazzi having to start on the Pirelli Cinturato Blue full-wet tire before switching to the Green intermediate tire for a five-lap run. Giovinazzi set a quick time of 1:56.339 on his sixth tour that placed him 19th overall. Grosjean also began on the Blue full-wet tire by running a single lap before making seven laps on the Green intermediate tire. His best time was a 1:56.211 on his seventh lap that placed him just ahead of Giovinazzi in 18th. Leading the way in FP1 was Verstappen, whose fast lap of 1:48.962 was 0.757-seconds better than teammate Daniel Ricciardo. Pierre Gasly of Toro Rosso, replacing Daniel Kvyat for the next two races, recorded the most laps with 14. The rain abated for FP2, raising expectations that dry running would allow for significantly increased track time and data acquisition. Instead, Grosjean and Magnussen dealt with understeer issues on both of their cars. Prior to his crash, Grosjean recorded 18 laps with his best time coming on his eighth lap _ a 1:34.118 set on Yellow soft tires. Magnussen tallied 17 laps with his best time coming on his 15th tour _ a 1:34.343 earned on Red supersoft tires. Vettel was quickest in FP2 with his lap of 1:31.261 being 0.604-seconds better than Räikkönen. Vettel’s fast lap also set a new track record, bettering the previous mark of 1:32.582 set by Fernando Alonso during qualifying for the 2005 Malaysian Gran Prix when he was with Renault. Pascal Wehrlein of Sauber recorded the most laps with 29. 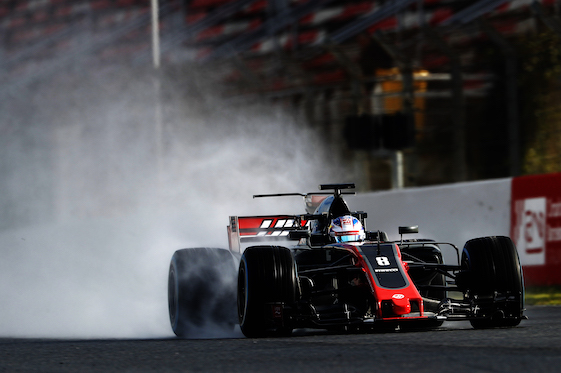 Between FP1 and FP2, Haas F1 Team ran a total of 49 laps _ 26 by Grosjean, 17 by Magnussen and six by Giovinazzi. Haas F1 Team debuted in the FIA Formula One World Championship in 2016, becoming the first American Formula One team since 1986. Founded by industrialist Gene Haas, Haas F1 Team is based in the United States on the same Kannapolis, N.C., campus as his championship-winning NASCAR team, Stewart-Haas Racing. Haas is the founder of Haas Automation, the largest CNC machine tool-builder in North America. He is chairman of Haas F1 Team.